A dialogue with Jeff Church, Producing Artistic Director, and Amanda Kibler, Education Director, both from The Coterie in Kansas City, Missouri. How do you balance the educational goals of the training of the young actors with the production demands of the show? JEFF: We call our actors “young professionals” when they are on our main stage. AMANDA: And we don’t have “kid wranglers.” We hold them to a higher standard than something that needs to be wrangled. JEFF: Yes, and you established calling it an apprenticeship. You do a letter of support to the parents. AMANDA: When a student is cast in a show, I’ll write a letter of support explaining what the apprenticeship is, what kind of objectives they’ll be learning throughout the rehearsal and performance process; it’s a letter that parents can use with their schools. JEFF: Usually we’ll double-cast, where a kid is missing school on Tuesdays and Thursdays and somebody else has their role on Wednesdays and Fridays. Regardless, you’ve got to have a parent that advocates on the student’s behalf to the school. AMANDA: And I focus that letter on college and career readiness. We think they are ready to take on professional work and they are ready for this extra step of preparing for their career. 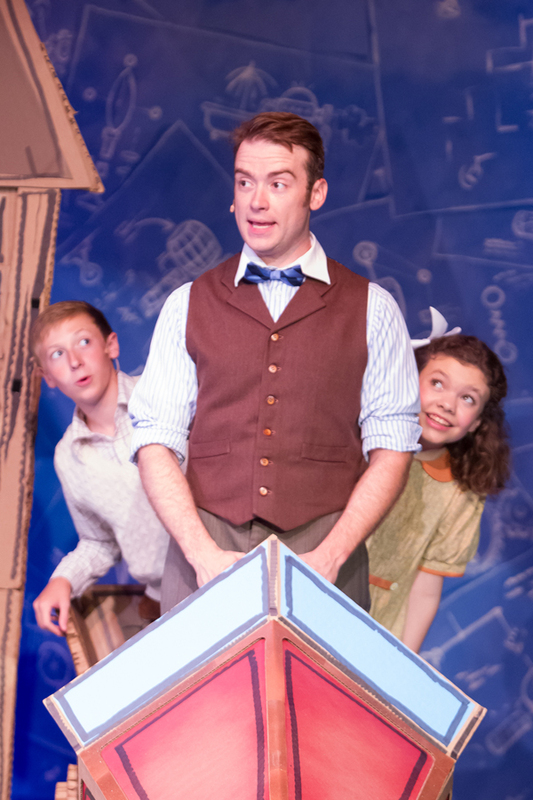 Left to right: Lucas Dorrell (as Jeremy Potts), Jake Walker (as Caractacus Potts), and Allison Banks (as Jemima Potts) in Chitty Chitty Bang Bang. Photo by J. Robert Schraeder and courtesy of The Coterie Theatre. How do we help the young actors balance the requirements for a part time job as an actor with a full time job as a student? JEFF: We feel 9:30 is the best release time. And even though the adult actors might go a little longer, we definitely release the kids at that time. Except for Friday nights. And they seem to really like to be up late with us. In tech when we go to midnight, they still have energy and everyone else has long languished. AMANDA: I think that part of helping them find that balance is when they’re not working they are encouraged and given space to do homework to keep their grades up. JEFF: One thing worth mentioning is that we have a specialization in our theatre school called Master Classes. Each year around 60 kids or more are invited to be a part of advanced study. And for young professionals in roles on the main stage we draw almost completely from this group. They have a real competitive advantage even though we have callbacks based on a community-wide open call. Students from Coterie Master Classes almost always prevail. JEFF: We don’t accept them in a position if they’re not going to do well. 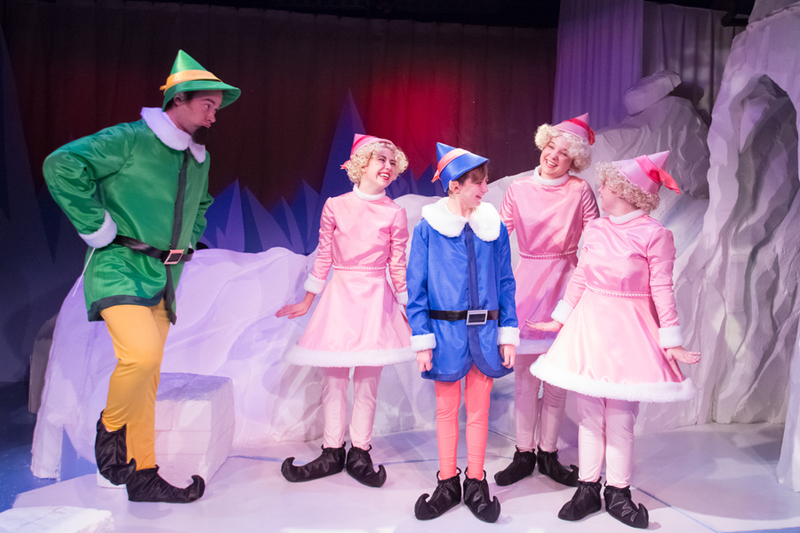 Jake Walker (as Boss Elf™) and Zoe London, Cam Burns, Maddie Bruegger, and Hannah Thompson (as Elves) in The Coterie’s production of Rudolph the Red-Nosed Reindeer: The Musical, running November 4, 2014 – January 4, 2015. Photo by J. Robert Schraeder and courtesy of The Coterie Theatre. Rudolph the Red-Nosed Reindeer ® The Rudolph Co., L.P. All elements under license to Character Arts, LLC. All rights reserved. How do you set up boundaries, guidelines, and procedures to ensure positive experiences for young performers when working with directors or fellow actors who may not be trained educators? JEFF: We have a joke around here that says “It’s not show fun, or show play, it’s show business”. And while it sounds brutal, it clarifies that in a professional production fun is extra gravy. I believe that Rudolph the Red-Nosed Reindeer, the young professionals in the cast would tell you it was fun. But there were plenty of times when I know they would tell you they had to get down to business. JEFF: The pride of doing a good job. I think too, when I think of the business side of show business, it is a dedication to concentration and staying on cue, to never miss an entrance. And that’s where you have to have a kind of self-determination to be at your best all the time. And that’s really what we’re asking for on the main stage. That said, I do try to mentor our guest directors that their job is to be an acting coach as well as be a stage director. I have had people who really aren’t used to directing children, and they don’t realize that kids may not automatically know to come in with a menu of choices ready to go. AMANDA: And I would like to start doing a little more work with the adult actors. Not all the actors are trained as educators. But having at a least a little bit of time at the beginning of the rehearsal process where I can come in and talk about what they can do to show them what a professional actor is? JEFF: I see a lot of excellent peer mentoring going on all the time…everything from their monologues to their resumes to commercial theatre work, like modeling and headshots. JEFF: I think that just encouraging people to involve themselves in the program of apprenticeship, would be very helpful. 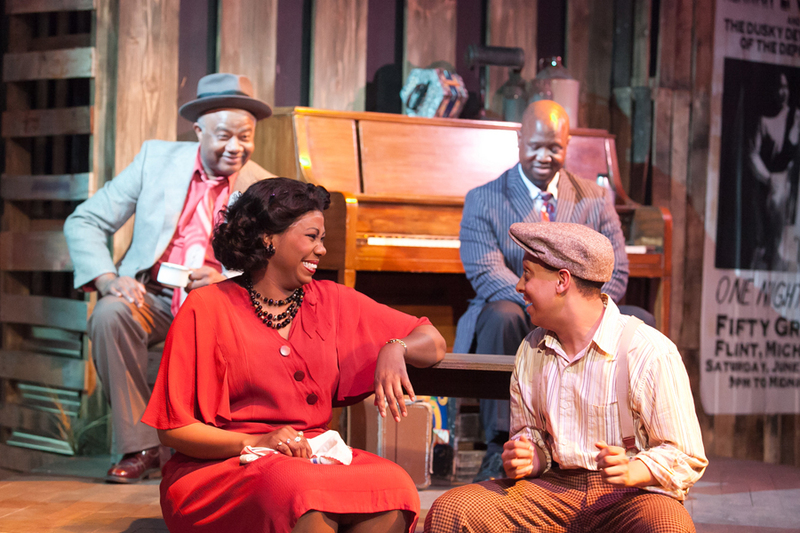 Clockwise from bottom left: Eboni Fondren (as Miss Thomas), Granvile T. O’Neal (as Mr. Jimmy), Elijah E. Murray (as Steady Eddie), and Aaron Branch (as Bud “not Buddy” Caldwell) in Bud, Not Buddy. Photo by J. Robert Schraeder and courtesy of Coterie Theatre. What are the ethics of asking the young people to pay to be in the experience, or be the only non-paid members of the cast? JEFF: In The Coterie’s case, we do pay our young professionals. There are some specifics around this. You have to be 15 or older to be paid and you are paid for performance weeks only. We look at rehearsals as part of a learning experience. So we’re not looking at these kids as a way of getting free actors. If you are under 15–and to be honest I don’t cast many people that young–you are unpaid. AMANDA: I think that it’s important that the young people who are pursuing the arts understand that it is a job. To create good art and to put it out there, you should be compensated for the art you create. JEFF: Especially in this society when young people want to be makers and doers. In the old days you would sit and just be content to watch a play and maybe someday you’d get a chance. That’s an old model. One thing that I should add too, that if you’re cast as a young professional you have to sign a real contract. They’ll be reading through a contract for the first time and that’s really important. AMANDA: That’s part of the educational experience also. Going back to “it’s show business”, if you end up being an artist professionally, you are self-employed so you have to understand the business side of it. You have to understand how to read a contract, do your taxes, budgets. This is something that not everyone is taught when they go out to be artists. Next PostAge Appropriate Casting: I Can Fly, I Can Fly, I Can—Oh I Can’t Be At Rehearsal Tomorrow. Amanda Kibler is the Education Director at The Coterie. She earned her M.F.A. in theatre for young audiences from the University of Central Florida. Before joining The Coterie, she worked as an actor, director, and teaching artist at the Omaha Theater Company in Omaha, NE, Orlando Repertory Theatre in Orlando, FL, and Visible Fictions in Glasgow, Scotland. She loves creating theatre for and with youth of all ages. Jeff Church joined The Coterie as Producing Artistic Director in 1990, which, during his tenure, has been named in the top five children’s theatres in the U.S. by Time Magazine. As a youth, he started a children’s theatre in his hometown of La Junta, Colorado, at age 15 and operated it for 15 summers while getting his BA in Fine Arts at Colorado College. In the 1980s he served as playwright-in-residence at the Kennedy Center Youth and Family Programs and taught at Duke Ellington School. He is instructor of Text Analysis for UMKC Theater.